Wind Keep Spellsword is a common Endurance creature card. It is part of the Core Set. 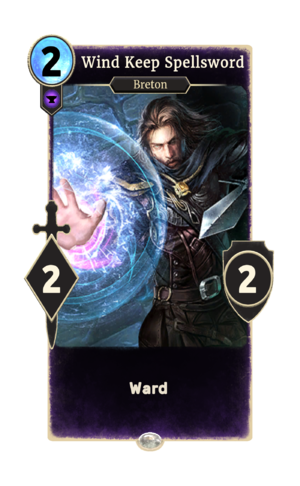 In addition to the card's availability in the Core Set, three copies are included in the Aela's Companions theme deck, two copies in the Redoran Onslaught theme deck, and two copies in the Telvanni Ambition theme deck. "Your lard-loaded footfalls betray you." "By Arkay's beard, this day will be mine!" The card is named for the High Rock town of Wind Keep. This page was last modified on 16 February 2019, at 12:50.